REGINA -- A lawyer for Saskatchewan's attorney general says the provincial government does not dispute climate change. "This is not a case about whether climate change is real or not. 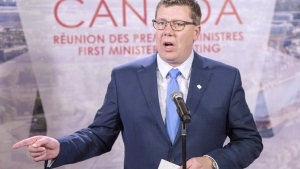 The government of Saskatchewan is not made up of a bunch of climate change deniers," Mitch McAdam said Wednesday in his overview of the province's argument that a federally opposed carbon price is unconstitutional. "The government recognizes that climate change is a serious issue that has to addressed and that effective measures are required to deal with greenhouse gas emissions. "None of that is in dispute." McAdam said the case before the Saskatchewan Court of Appeal is not about science, but rather about constitutional law and the division of power. A panel of five judges is to listen to arguments from both the Saskatchewan and federal governments as well as from 16 interveners on both sides of the dispute. Saskatchewan's lawyers are making their case first and are to be followed by the provinces of Ontario and New Brunswick, who also oppose a federal price on pollution. Other anti-tax interveners are also to speak. On Thursday, Ottawa is to get its turn as well as interveners from the pro-carbon-tax side. Saskatchewan argues a federal levy is unconstitutional because it's not applied evenly in all jurisdictions. Provinces that already have their own carbon-pricing plan are not subject to the federal tax. "I would put this case on a short list of important federalism decisions that courts have grappled with," University of Alberta law professor Eric Adams said before the hearing started. Saskatchewan Attorney General Don Morgan has said challenging the constitutionality of Ottawa's carbon tax is the right thing to do for his province's residents and its energy sector. Saskatchewan is one of four provinces without a carbon plan that will be subject to Ottawa's fuel charge starting in April. The federal government's carbon price starts at a minimum at $20 a tonne and rises $10 each year until 2022.